Please note there is currently an external connection problem with the existing phone number. 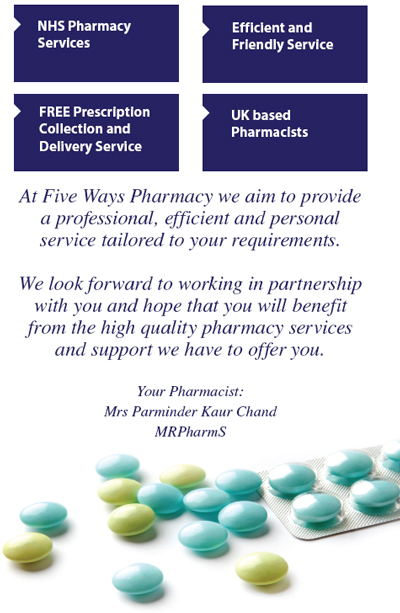 Welcome to Five Ways Pharmacy. 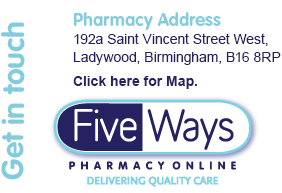 We are an independent pharmacy with premises located in Ladywood, Birmingham. We are easily accessible and our central location allows us to deliver our pharmacy services to patients both locally and nationally. We are a caring and friendly team of fully trained pharmacy staff and we are committed to providing high quality pharmacy services. We are registered with the General Pharmaceutical Council (GPhC) and our internet pharmacy contract allows us to provide all the essential pharmacy services that you are accustomed to in the community. We dispense both NHS and Private prescriptions with the added convenience of having free delivery direct to your door. We have robust systems in place to take care of ordering and collecting prescriptions and our Standard Operating Procedures dictate the accurate assembly and delivery of your medication. We offer a safe, reliable and trustworthy medicines management service because we genuinely care about your healthcare needs. Our highly skilled team are able to offer sound advice and support by responding to your symptoms discreetly and confidently via email or over the telephone. We can offer support on a wide range of medical problems and symptoms. We aim to improve access to pharmacy services for people in the community that are unable to get to high street pharmacies. We can do this by providing them with free delivery of over-the-counter medication and prescription medication direct to their homes or other nominated delivery address. 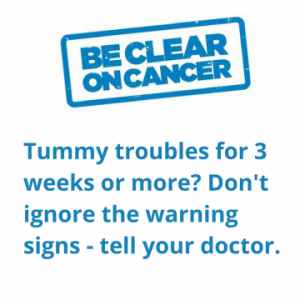 Please click the Be Clear on Cancer picture below to link you to the NHS England website for more information. Our latest Patient Satisfaction Survey carried out in May 2017 shows that we are performing well in all areas of our service.